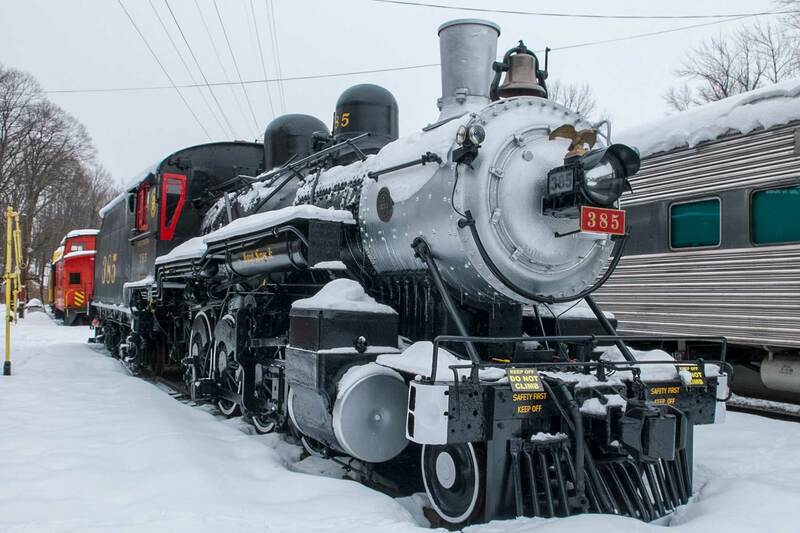 On Saturday, December 10, ERA attendees joined those from the NY Railroad Enthusiasts for the annual Holiday trip. The first stop was near Convent Station on the Morris and Essex Line, with the luncheon at Rod’s Steak and Seafood Grille within the Madison Hotel. Seating was in the parlor car. Afterwards, chartered school buses transported us 10 minutes away to the Whippany Railway Museum. The majority of our group sat in the club car, the rest in coach of the 3 PM train. The ride was 45 minutes round trip. Approximately 37 people attended the trip. Afterwards, the bus brought us to Morristown station for the return segment. The trip went very well, with an excellent lunch. The museum was busy but accommodated the group well. The Blue Comet observation car was just gorgeous. It’s time again for the traditional NYRRE Holiday Trip, which is being co-sponsored in 2011 by the NY Division and the New York Railroad Enthusiasts. This year we’ll return to a favorite spot of ours, Rod’s Restaurant, in Convent Station, N.J. Here we will lunch in one of their restored vintage OBS Cars restored to 1920’s era glory. NJ Transit Morris and Essex line (col-sm-6-Lackawanna) delivers us just a short walk from their door on the Mid-Town direct service from Penn Station, N.Y. Meal choices are: classic grilled chicken Caesar salad, imported penne pasta pomodoro, sautéed Maryland jumbo lump crab cake, or prime sirloin steak burger. A choice of soup or a salad, coffee or tea, and dessert are included. Alcoholic drinks on your own. Following lunch, our De-Luxe Yellow Coach (aka, school bus) takes us to the Whippany Railway Museum. At the Whippany Station, a train ride follows on their Santa Train with the first 25 reservations riding in their parlor car. Others, alas, will have to make do with plain coach seating. Our route is on the fabled Morristown & Erie shortline freight railroad. Finally, our bus drops us at the beautifully restored Morristown Station of the col-sm-6-Lackawanna for our ride back to Penn Station. Leave Penn Station at 10:11 am; arrive at Convent Station, N.J. at 11:22 am. Leave Morristown, N.J. at 4:30 pm; arrive Penn Station at 5:44 pm. The ticket price for the trip is $78 ($70 for seniors 62 and older). Price includes round trip transportation, luncheon, and Whippany Railway ticket. A PDF of the trip flyer can be downloaded below. Full payment is due with your reservation. There is no refund if cancellation is given less than two days before the trip. Please make your check or money order out to: RRE, NY Division Trip Fund, Inc. Trip orders are due by November 19, 2011.